Omar is an asylum seeker from Darfur, Sudan, who's living in Israel at the moment. 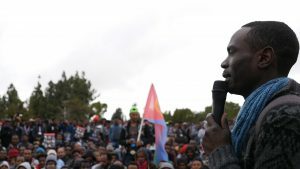 While Israel still refuse to accept people who escape from Darfur, Sudan, as refugees, Omar need to deal with the reality in Israel and became an activist for the asylum seeker community. The conflict between his outer world, his day to day life as a warrior taking on an entire nation’s battle, and his inner world, which takes place in an animated studio setting, delving behind the scenes of Omar’s personality and depicting the events and the people who have influenced him.